Introduction: In this article, Mary Harrell-Sesniak gives tips for establishing the provenance of family records – and provides a handy checklist. Mary is a genealogist, author and editor with a strong technology background. 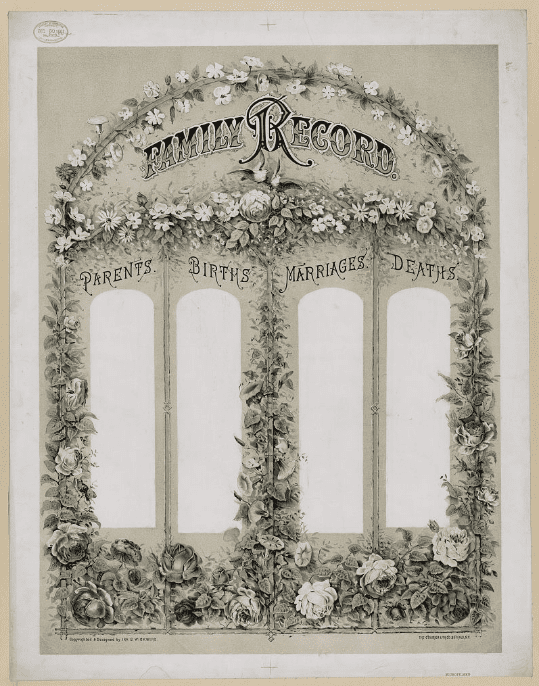 As genealogists, we are always looking for proof of family births, marriages and deaths (BMD). 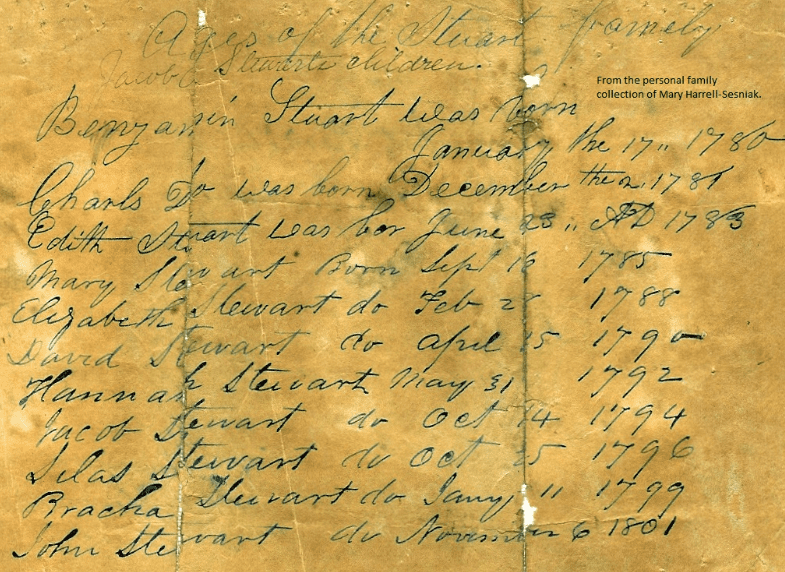 Many documents, such as this of my Stuart family, are still in private hands – and in the interest of helping related cousins, I would like to encourage others to share records such as this. Since the provenance of the document is important, you may wish to add an identification to what you share. Note the provenance recorded in the upper-right-hand corner. Photo: Stuart family record, published 2019 in conjunction with this GenealogyBank Blog article. For non-professional research purposes only. Some organizations have their own ideas of determining authenticity and provenance of documents, but mine are a little different. In the chart below, I’ve presented my ideas in a Q&A format with space to add a question or two of your own. Dates can determine recording dates and establish the reliability of the information. Do you have the title page showing the year of publication? What is the earliest or oldest recorded event? What is the most recent or newest recorded event? How many family generations were recorded? Use handwriting to determine the recorder and if this is a copy of another record. Is the original informant (recorder) identified or identifiable? Does the handwriting change (indicating more than one person)? Is a later informant identified or identifiable? Was there calligraphy or a typewriter with identifiable type used? Can you determine the era based on the handwriting or style of abbreviation? For example, the use of “ditto” is more modern; previously it may have been shown by “do” as seen in the Stuart document above. Was everything recorded using the same instrument (pencil or pen)? Was anything added to the record at a later date? Was any information overwritten (common for fading issues) or erased? Is the handwriting neat or messy (which can indicate if hastily made)? Are there any variations in spelling (names or otherwise) in comparison to other records? Look at the information and think about the type of information presented and potential uses (for example, proof to obtain a pension or to join a lineage society). Does the record show only births? Does the record show only marriages? Does the record show only deaths or burials? Does the record show baptisms, confirmations or other events? Does the record show religious events (Baptism, Bar Mitzvah, Bat Mitzvah, Confirmation, etc.)? Is the first female identified by maiden name? Observe what else the document reveals (style of paper, coloration, damage, etc.). Was the information recorded in an older or more modern style? Has this document ever been folded or framed? Folding can indicate mailing or storing in an envelope. Are there identifying marks, such as the publisher, date of publication, or in the case of a fraktur, an artist’s name or initials? Were locations mentioned which can indicate removal of a family from a particular location? Can you identify how this document came to be in its current location or possession (via will, mother to daughter, antique shop, historical society, etc.)? Does anyone else have copies of this record?